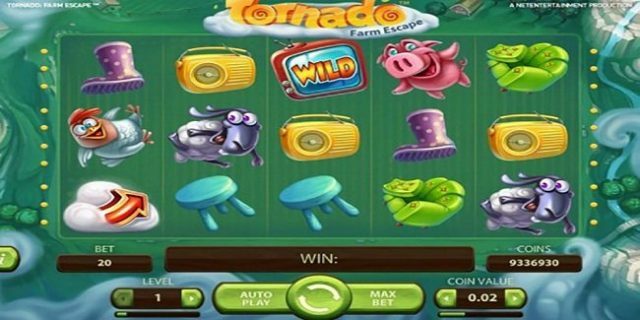 Tornado Farm Escape slot is 5 reels and 20 Paylines video slot game powered by NetEnt software platform. 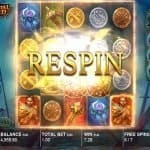 The game has minimum coins per line 1 and maximum 10, while coin size for this slot ranges from 0.01 to 1 per spin. 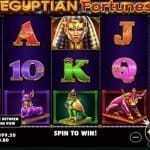 This slot offers a jackpot of 7000 coins and return of the player percentage is 96.5%. Tornado Farm Escape slot includes special symbols such as TV, which is the wild symbol as well. Hot and cold symbols of the game trigger special features. 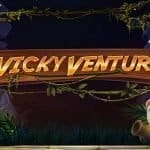 You could play Tornado Farm Escape slot at any NetEnt online casinos. The game contains buttons like “Coin value” which is used to Select a coin size, “Level” is used to adjust the number of wagered and “Spin” button is used to play the game. “Auto Play” and “Max bet” options in this game are being used to play for a number of times in succession and to spin the reels at the maximum wager. The Tornado feature will be triggered when hot and cold symbols appear on the first or fifth reels. Additional coins will be awarded on every active and wild symbol collected.